Did the last thunderstorm ruin the shingles on your roof to the point where you need to hire a roofing contractor to fix them? 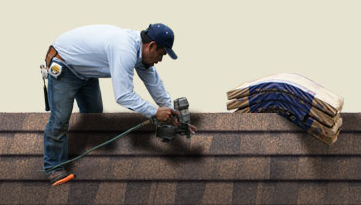 If so, DeKalb Roofing Company offers the best roofing shingles for your Atlanta home! Our architectural shingles deliver impressive, long-lasting results that will keep your home’s exterior looking beautiful for years to come. Whether you are quite knowledgeable about roofing and roof shingles, or you haven’t the slightest inkling about the topic, our roofing contractors are here to help you! Our well-trained and knowledgeable roofing and gutter installation experts have been employed within the industry for 10 or more years each. That means we can educate you about the processes, as well as present the facts and details about the quality roofing products we utilize. To start with, architectural shingles are also known as dimensional shingles or laminated shingles. In case you haven’t heard much about them, they are the highest quality roofing products that we could ever offer you, our customer! Why are architectural shingles better than other traditional shingles (i.e. standard asphalt shingle) on the market? Well we’re here to tell you why! Architectural shingles are quite a bit heavier in weight than traditional shingles, which means we don’t have to add extra support underneath the roof. This heavier mat base consists of organic materials or fiberglass, in addition to some asphalt. Architectural shingles create a distinct, beautiful look to roofs. Our customers who have particularly large homes love architectural shingles for their impressive appearance. The relatively simple installation process of architectural shingles allows for sturdy, long-lasting results. There are times when we install each shingle with nails, and other times we use both nails and the interlocking tabs that are attached to the shingles. 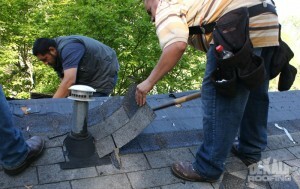 This technique creates a tight adherence to the roof and shingles to last long and make them more durable. Architectural shingles last longer than traditional shingles. Actually, architectural shingles last between 30-50 years! Their flexible, strong design enables them to withstand extreme temperatures and strong weather events (i.e. heavy hail, strong winds up to 120 mph, etc). Typically, they come with a lifetime warranty–now who can say “no” to that? As with many other products on the market, each material is best suited for certain environmental conditions. For instance, if your home is located near a forest that is prone to fires, these homeowners would probably benefit the most from an architectural shingle made of slate due to it’s fire-resistant benefits. Call us today for your free roofing quote! Well now that you know more information about the architectural shingles that we offer, are you ready to receive the best roofing shingles? If so, we encourage you to call us for your free roofing estimate today!